I'll save Evgeny Kuznetsov -- No. 92 in your program, No. 4 on your forward lines and potentially No. 1 in your heart -- for last, as it might require the longest response. As for Tom Wilson (No. 43), he's expected to play 8-10 minutes with the Hershey Bears on Friday against the Lehigh Valley Phantoms. "Wilson is going to play 5-on-5," Bears coach Troy Mann told Tim Leone. "We'll just see how it's going. They've asked for 8-10 minutes [in Washington]. If he's playing 5-on-5, he will probably be in that range. I might throw him on the second power play unit, as well, or maybe save that for Sunday just depending on how things are going." If all goes well, then I would anticipate Wilson making his season debut against the Detroit Red Wings next Wednesday, likely in a minor role before being gradually elevated in the lineup. Moving on, the biggest surprise so far this season has been Andre Burakovsky. Here's a 19-year-old rookie not only transitioning to center but also to the NHL, both of which present unique challenges. And through six games, he has certainly impressed. Among all rookie skaters, his six points are second-most in the league and the most by a Capitals player in his first six games since Alex Ovechkin's seven in 2005. At even strength among his teammates, he has four points (tied for second with Troy Brouwer) and a Corsi percentage -- a proxy for puck posession -- of 62.5 (first). 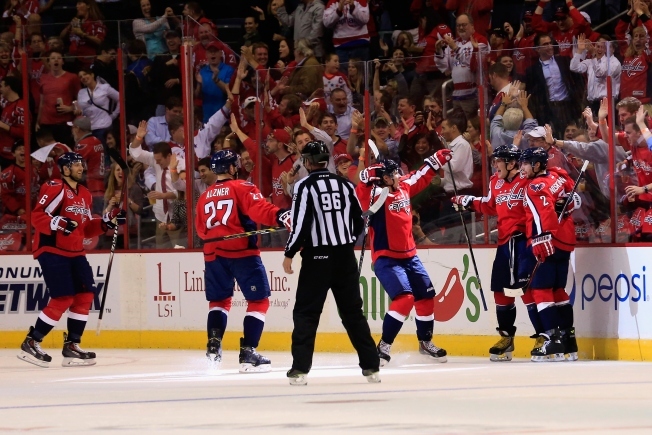 Burakovsky, to borrow from Japers' Rink, "has shown himself to be a dynamic player." Honorable mention to Marcus Johansson, who said before the season that he was going to shoot more, and has. His 8.77 shots per 60 minutes at 5-on-5 trail only Ovechkin and more than double his output from the last two seasons combined (4.11). Honestly, there hasn't been anyone whose performance thus far has negatively impacted my opinion of them. Glenn Healy may beg to differ with me, though. Alright, back to Kuznetsov. Because Capitals fans always have to be in a huff about something (like right now when you inevitably scoff at me for telling you that you are always in a huff), Kuznetov's deployment as fourth-line center has confounded many. He's averaging roughly nine minutes of even-strength ice time per game, three fewer minutes than he did in a slightly larger sample size last season. Interestingly enough, he is receiving favorable deployments, starting 82 percent of his shifts in the offensive zone, but is being roughed up in shot differential (46.81 Corsi percentage). His linemates (Liam O'Brien, Chris Brown and Michael Latta) are not doing much better, though. Before you lambaste coach Barry Trotz for his decision-making process, read what he had to say to colleague/fellow hot dog enthusiast Alex Prewitt. "I'm looking for a guy like Kuzy to have a real strong career for the next 15 years or so," Trotz said. "What happens here in the next two weeks, or a month from now, will have what I think very little bearing on his long-term success here." "It's big problem for me last season when I come," Kuznetsov told Prewitt about his ice-time preference. "Right now, I understand. Give me six minutes or eight minutes. It doesn't matter to me. All we need to do, win the game." @AdamVingan Are O'Brien, Latta, and/or Schmidt here long term? Speaking of Kuznetsov's linemates, one has to wonder what the future holds for O'Brien and Latta (and Brown) when Wilson and Aaron Volpatti return from their injury-induced absences. O'Brien is a terrific story, a player passed over in multiple drafts who wows the Capitals' front office, earns an entry-level contract and wags his tongue at John Scott. Unfortunately, I believe his story will end in Hershey in the coming weeks. It won't come as an indictment of his overall play, but simply a logical move to make room on the roster. Latta, however, may stick around. He and Brown have split time on the fourth line, each appearing in three games, but Brown is waiver-exempt. Latta isn't, so that may give him the edge. Schmidt, who I must say is one of the smiliest people I've ever met, seems destined for Hershey as well when Dmitry Orlov heals from offseason wrist surgery. Jack Hillen should function as the seventh defenseman. @AdamVingan what will it take this season to get the caps to stop allowing goals within 30 seconds of scoring themselves? Last season, the Capitals allowed 29 goals within two minutes after scoring, tying the Los Angeles Kings' record set in 2010-11. The first instance this season came Wednesday in Washington's 3-2 loss to the Edmonton Oilers. Ovechkin whiffed on a shot from the left point, allowing Ryan Nugent-Hopkins to scoop up the puck and scoot up ice for a game-tying goal 20 seconds after Mike Green gave the Capitals a 2-1 lead. What will it take for them not to give up 28 more? Not missing shots from the point that allow for breakouts in the other direction, for one. For what it's worth, the Capitals have been better in "close" situations this season, defined as the score being within one goal in the first and second periods or tied in the third. Their Corsi percentage is 54.9, compared to 47.66 last season. Really though, one isn't too much to worry about. Call me when they get to five. My number is [REDACTED].